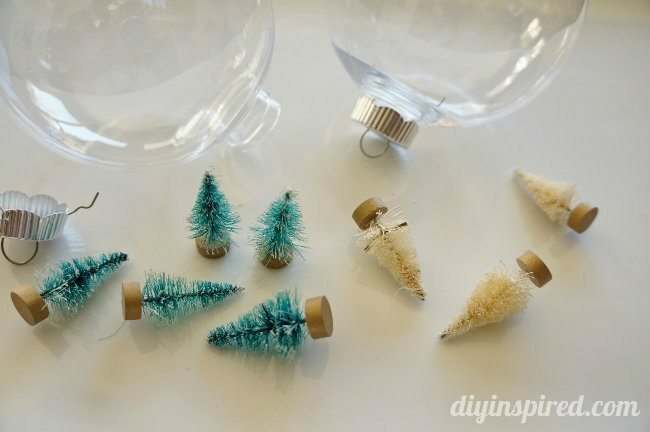 I have always wanted to try to make these, ever since I made my winter forest in my apothecary jars last year. I’m sure there are several ways to make them. 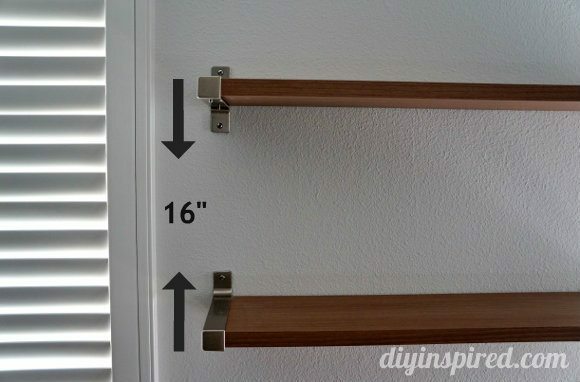 The way I tried it, worked pretty well, and I did this project is just a few minutes. 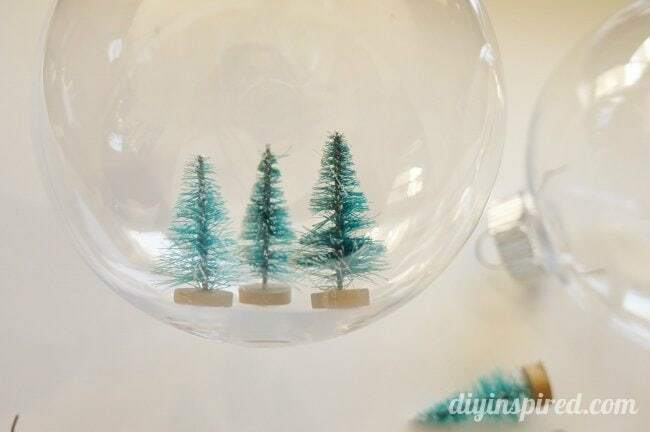 Here is how I made my DIY snow globe ornaments. I found these little trees in green and white. There are so many different kinds. 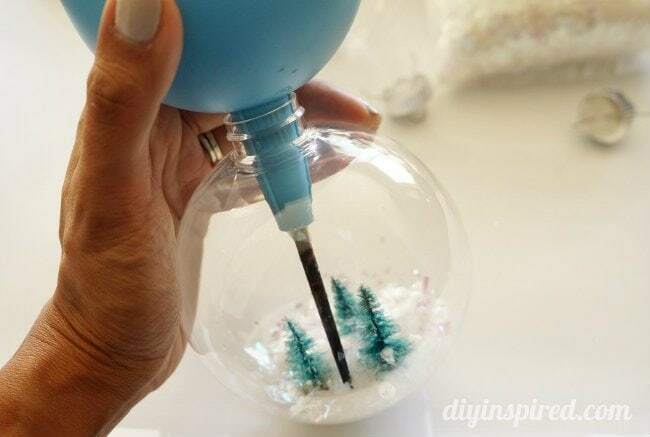 Just make sure they will fit through the ornament ball opening. Carefully pinch one tree from the top, until you feel you have a good grip on it. For me, it took a couple adjustments. Carefully add a dab of hot glue on the bottom of the tree. 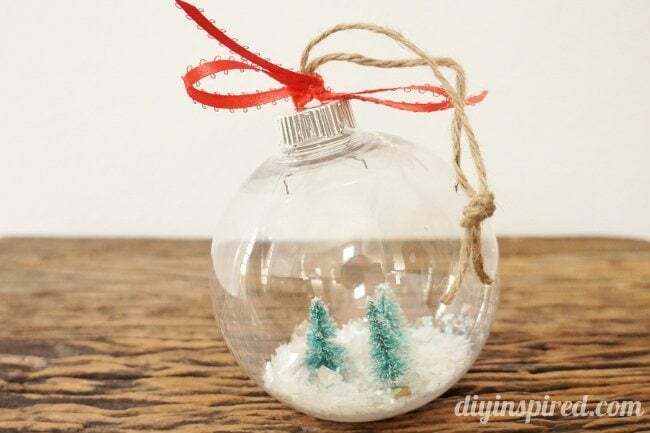 Quickly and carefully, place your tree inside the ornament. 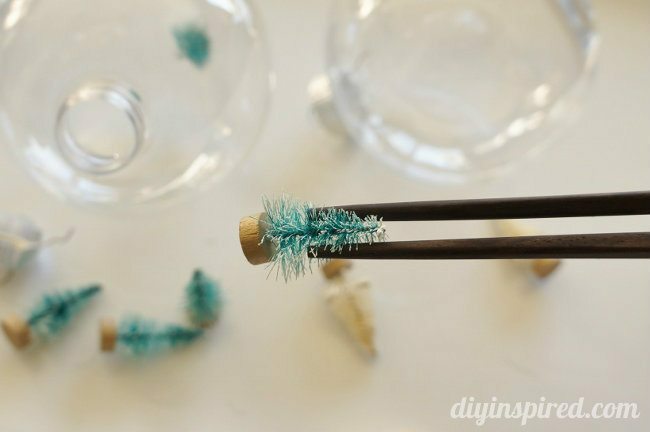 When working with plastic and hot glue, it attaches right away, so once the glue hits the plastic, there is only about 2 seconds (literally) to place and adjust. 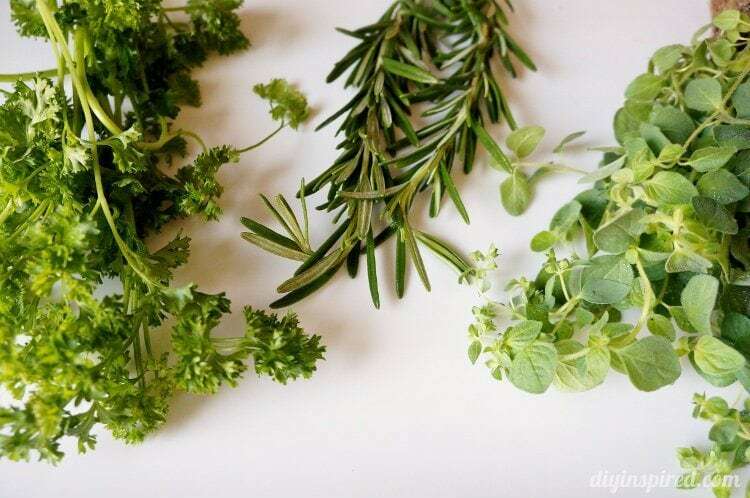 Repeat until you are satisfied with your mini forest. 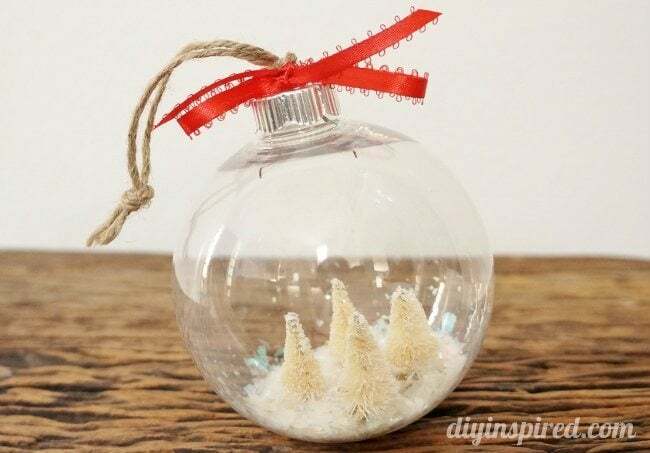 Using a funnel, fill your globe with artificial snowflakes. 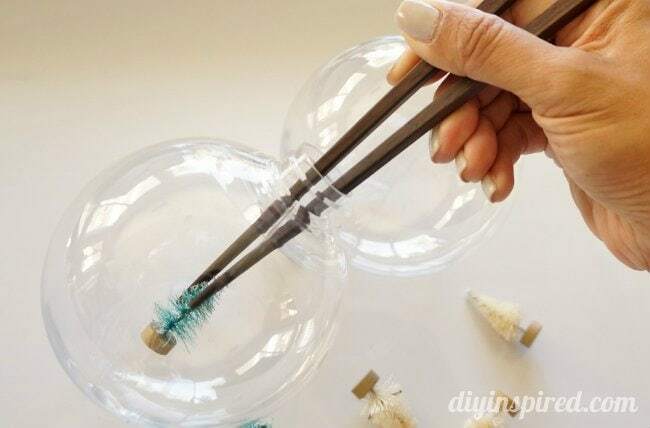 The chopsticks come in handy to help push the snowflakes into the ball. 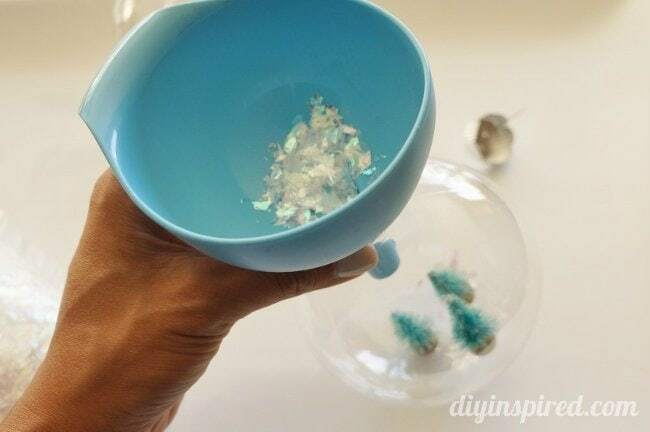 Gently shake the globe to get the flakes to spread out evenly. 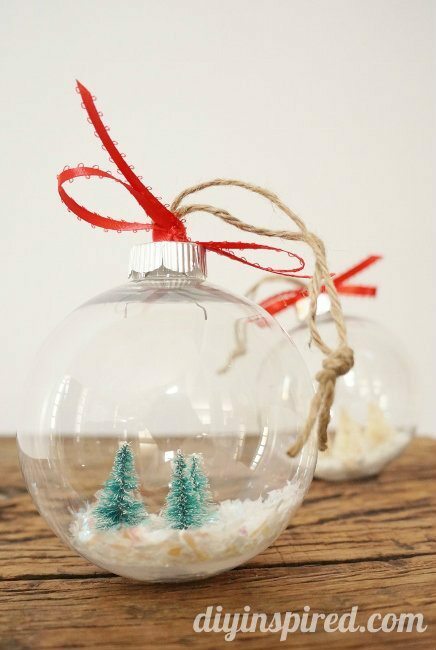 Tie ribbon and twine to your ornaments. These would make great Christmas gifts or even a neighbor or teacher gift. These ornaments are so pretty Dinah! Where did you find those tiny little trees? I can find everything else but not those. I would love to make these, they are adorable!! Hi Amy! So glad you like them! I bought these at Jo-Ann Fabric and Crafts. I have also seen them at Michael’s Craft stores as well. If they are not in the Christmas section, check the miniature (doll house or mission) section. Good luck! I couldn’t find them in the Christmas section at my Michaels but didn’t even to think about the miniature section…Thank you!! Hi! I Love your site! Just found it uhm, this morning. This Christmas I’ve chosen to ATTEMPT homemade gifts, for everyone. My first attempt was to make snowglobes for my grand babies (3 & 4). I’m working with an extremely limited budget and am finding it’s almost cheaper to just go ahead and BUY the things! Your ornaments are absolutely beautiful BTW 🙂 and I’m in love with the miniatures, which I THOUGHT would be so easy to find. This is not the case in my area :-‘( So would you care to post where you found your minis? I would be eternally grateful!! I’ve already purchased some items, but I’m not sure they are gonna work. In asking a sales associate at Hobby Lobby if he thought they’d hold up, his answer was pretty much everything would work?!? Thank you so much for your time and all of the incredible work I’ve seen! Best wishes!! Thank you so much Christina! I love that your attempting homemade gifts this year. Do you have a Michael’s Craft Store or Jo-Ann Fabric and Crafts near you? I have seen them in both of those stores. If they are not near the Christmas items or Christmas village scenes, check the section where they sell miniatures for doll houses. At Jo-Ann’s they are near the wooden craft ornaments. I hope this helps! Thanks so much for your kind words and good luck making your gifts! Do you know about how much per ornament these cost to make? 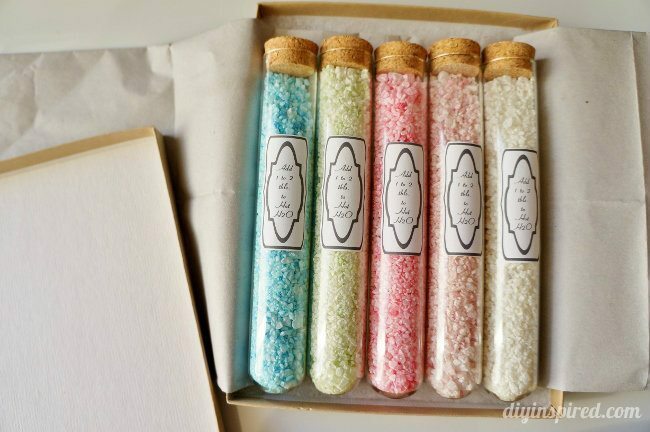 They are so cute, I would love to make them with the girls I work with in our church’s youth group! 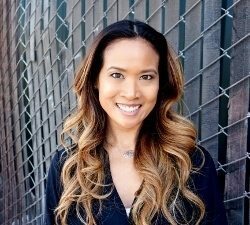 Hi Kristina! I’m completely estimating but I believe the plastic ornament balls were around $2.99 a piece. The Mini Trees came in packs of 12 for about $5.99 a pack. You can buy the snow for about $5 a bag (which would fill many ornaments). But with all the sales right now you may get a good deal. I hope you try it out! Let me know how it goes! I’d love to see a picture. What size/brand of globes did you use? Did you buy them offline or in a store? Looking for something to put my baby’s first years keepsakes in like hospital cap and shirt. Thanks! Hi Kelly! I don’t remember the brand but I do recall buying them at Hobby Lobby. I hope this helps!